This scent is a bit strong but the uniqueness is something to experience to be believed. I deducted a star because it has a sickly sweet smell the first hour of application but after it dries down it's got ab amazingly delicious scent. It is definitely worth the addition to your collection and people will be asking what you're wearing. Love, love Aura Mugler! My favourite fragrance ever!! AURA Mugler is addictive! My first impression was questionable....after wearing it for about an hour, it grew on me. Now I'm completely hooked. It's like nothing I've ever worn, and I've been thru many many Fragrances; from very expensive to modest. I absolutely LOVE AURA! It has AWESOME staying power, not too sweet. One of my TOPS! 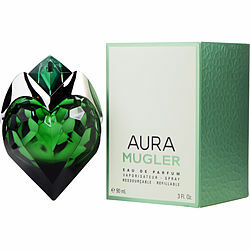 As a long time lover of all Thierry Mugler scents, I purchased Aura right after its release. This is my FAVORITE by far! Amazing mix of sweet and spicy! My boyfriend loves this and get stopped constantly about it!